President Luis M. Proenza announced today the appointment of James P. (Jim) Tressel to the newly created position of Vice President for Strategic Engagement in support of programs that promote student success. 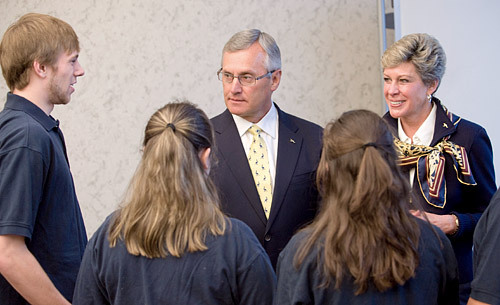 Jim Tressel and his wife Ellen meet with students on campus Thursday morning. "Jim has touched thousands of lives in positive ways," said Dr. Proenza. "He has incredible energy and demonstrates leadership, passion and compassion for students. We feel fortunate that he has decided to bring that dedication here to The University of Akron. Our students will be the beneficiaries." As the Vice President for Strategic Engagement, Tressel will identify, recommend and support strategies and efforts that promote success in all facets of student life, including alumni and friend engagement, and collaborations and partnerships with community organizations that have an influence and impact on UA students and their futures. Dr. Proenza referenced specific programs that are part of the recently released strategic plan, Vision 2020: The New Gold Standard of University Performance. One program called The Akron Experience combines curricular and co-curricular experiences so that students are connected to community, organizations, industry and people in their field of interest, to ensure a distinctive college experience and enhance their employment opportunities. Another program provides students with targeted pathways to success, based on their readiness for college. Students will have mentors who can help them along during college and beyond. "We know that our programs for student success will require tremendous leadership from our staff and support from volunteers throughout the community," noted Dr. Proenza. "Jim Tressel will help us engage our alumni and friends in support of our students." Tressel spent four years at The University of Akron, receiving his master's degree in education in 1977. He served as assistant football coach and instructor of physical education at UA from 1975 to 1978. "I have great memories of my time at UA and, more importantly, I feel a real sense of family when I’m on this campus," said Tressel. "I am inspired by the vision of President Proenza. I admire what he, the leadership team and the faculty have accomplished over the last decade to build the reputation of The University and lay a strong foundation for student success. I'm looking forward to being part of the spirit of innovation that drives The University of Akron." 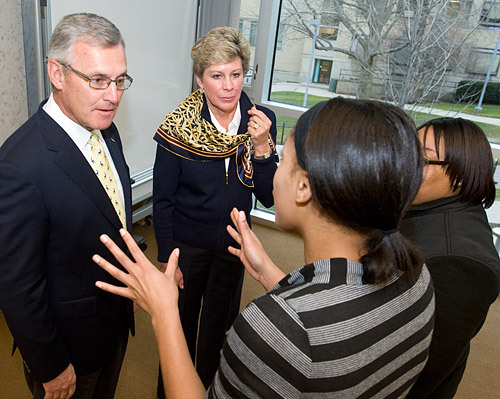 Pending approval by the Board of Trustees, Tressel's employment will be effective May 1, 2012, with a base salary of $200,000. Tressel grew up in Northeast Ohio, graduating from Berea High School in 1971, and receiving his B.A. in Education from Baldwin Wallace College in 1975. His experience in coaching began in 1975 and continued through 2010 on the campuses of The University of Akron, Miami University of Ohio, Syracuse University, Youngstown State University and The Ohio State University. Recently, he served as a consultant to the Indianapolis Colts. He has published two books: The Winners Manual: For the Game of Life (2008) and Life Promises for Success (2011). Media contact: Eileen Korey, 330-972-6476 or korey@uakron.edu.